For a change tried Murukku with a healthy Ingredient "Oats". I followed my Instant Rice Murukku / Pottukadalai Murukku recipe and added half a cup of oats to it, to my surprise Murukku turned out so Crunchy, crispy and tasty. I made it as Vegan without butter and added hot oil to the flour mix that resulted in nice crispy and crunchy murukku. I actually planned to try Murukku or Sev with Millet Flour but after seeing Oat Flour in Indian Store, changed my mind from millet to Oats. Thanks to V for the idea of Oats Murukku. Also planning to try Quinoa Sev before this Diwali, lets see. Now off to the Oats Murukku Recipe.. In a mixing bowl, add rice flour, oat flour, roasted gram dal flour, chilli powder, salt, hing, cumin seeds, ajwain, sesame seeds and mix well. To this add hot oil and mix well and using water little by little knead it to a soft and non-sticky dough. Then divide the dough in to 4-5 big balls and keep covered with a damp cloth. Heat oil in a kadai for deep frying, then grease murukku achu with oil and fill with it with one divided ball, close it tightly. 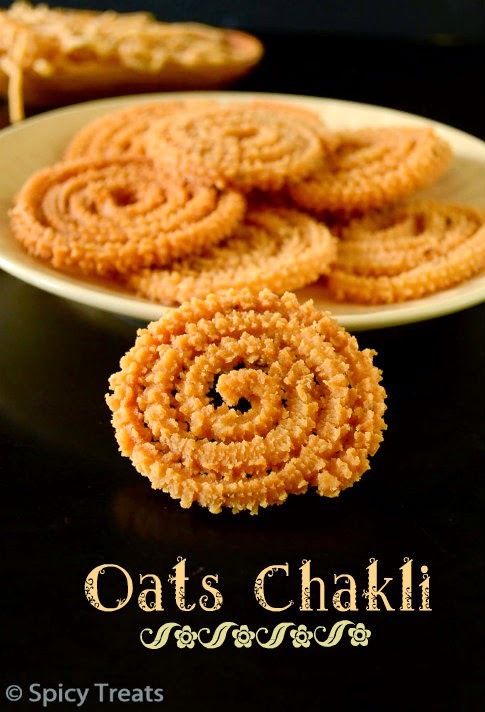 Use single star shaped achu/plate or 3 plain dots for making Oats murukku(as show in the pic). While the oil get hot, shape the dough in to greased plate or ladle and when oil gets hot, drop the shaped murukku and fry in medium hot oil. That's it...super crunchy and tasty Oats Murukku ready. *I used store bought Oat flour, but you can make it at home using rolled oats. Just dry roast 3/4 cup rolled oats and allow to cool for a while and grind it in a mixer to a smooth powder, sieve it and use it in the recipe. My 3 dots achu/plate was too tiny, murukku were slightly thicker than the Omapodi, so I changed the plate with Star achu/plate and finished it quickly. You can shape the murukku with your desired achu/plate. 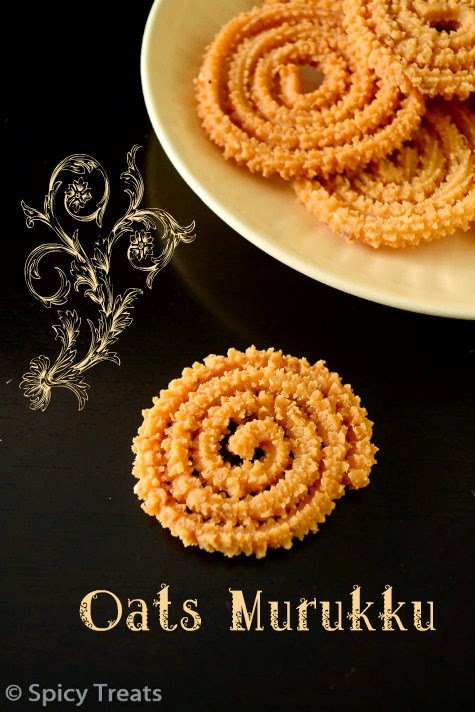 If you are not able to shape the murukku properly, the reason may be the dough is loose and moist, so try adding 1-2 tbsp rice flour and try shaping it. 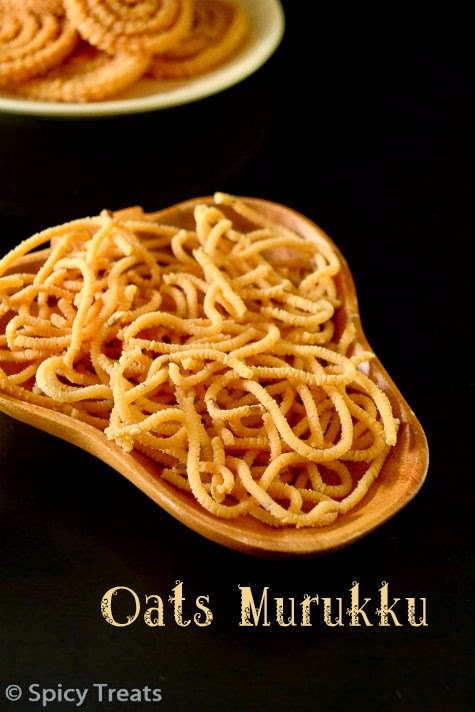 Oats murukku sounds interesting and delicious! 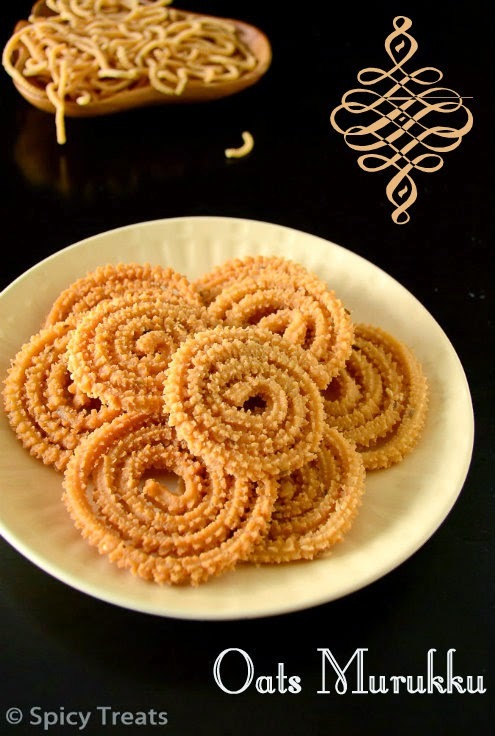 Perfectly shaped murukkus, oats flour in murukku, that's a kalakkal idea Sangee..
i just made muruku tastes good but all shapeless how did you make them into perfect circles.well done. Thanks Princy for trying it. Ohh...reason for shapeless murukku, it depends on rice flour quality, texture and also the dough may be extra moist. If its moist means, you can try adding 1-2 tbsp of rice flour and test it. Also you should sift all the flour before use. Hope this helps. Thanks again for your prompt feedback. oats murukku looks yummy. Love the idea of adding oats. Thank you for linking the recipe to the diwali event. 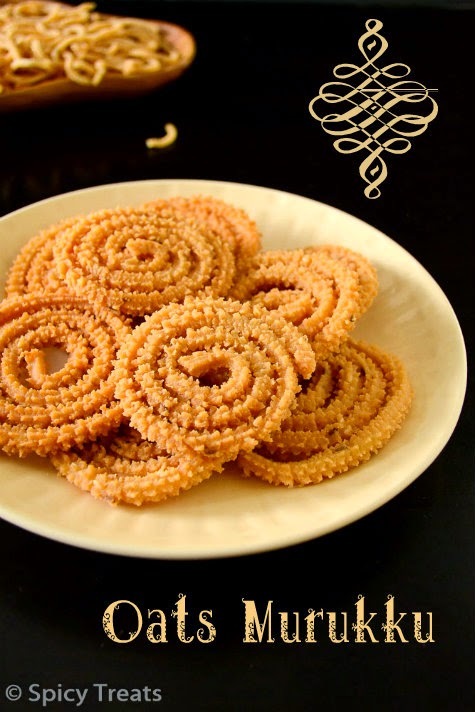 Hi,I am 65yrs old.I have made so many murukkus in my lifetime.I was impressed with ur recipe so I tried it.But you have given all wrong measurements.It came out shapeless in tiny pieces.The dough was not sticky.Infact i shifted the flour but still it was not kneadable.It's absorbing more oil.So I suggest you to post a video with the above measurements to shows us how did you managed to get the shape with your given measurements.Waste of time.Waste of oil. Hi Mam, First sorry that my recipe didn't turn out good to you. Before, writing you a reply I once again tried this murukku yesterday and it turned out as perfect as the above picture. But I dunno what went wrong for you, I want to say that I never share untried or failure recipes here. All the recipes shared here are tried my be in my kitchen, There may be few things for the failure, the rice flour texture and quality differ from brand to brand. That's why i mostly avoid water measurement..your dough should be soft and smooth to get shape, if it is too much on dry side it will break and you cant shape well. Another thing, for some rice flour quality you don't need much pottukadalai maavu, if your murukku is breaking means, your dough is more of coarse side so you need to add couple of spoons of rice flour and water and knead well and try. Also, i don't know what oat flour you used whether you grind at home or readymade oat flour, that also matters. Regarding, oil absorbing ...as you could see from the pictures this murukku doesn't drink oil. I will try to share a video if I get helping hand.